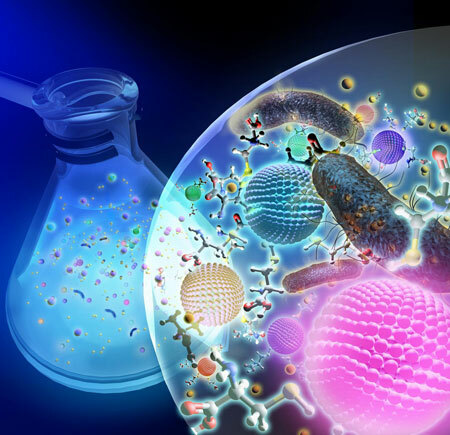 (Nanowerk News) A team of Lehigh University engineers have demonstrated a bacterial method for the low-cost, environmentally friendly synthesis of aqueous soluble quantum dot (QD) nanocrystals at room temperature. Principal researchers Steven McIntosh, Bryan Berger and Christopher Kiely, along with a team of chemical engineering, bioengineering, and material science students present this novel approach for the reproducible biosynthesis of extracellular, water-soluble QDs in the July 1 issue of the journal Green Chemistry ("Biomanufacturing of CdS quantum dots"). This is the first example of engineers harnessing nature's unique ability to achieve cost effective and scalable manufacturing of QDs using a bacterial process. Using an engineered strain of Stenotrophomonas maltophilia to control particle size, the team biosynthesized QDs using bacteria and cadmium sulfide to provide a route to low-cost, scalable and green synthesis of CdS nanocrystals with extrinsic crystallite size control in the quantum confinement range. The solution yields extracellular, water-soluble quantum dots from low-cost precursors at ambient temperatures and pressure. The result is CdS semiconductor nanocrystals with associated size-dependent band gap and photoluminescent properties. This biosynthetic approach provides a viable pathway to realize the promise of green biomanufacturing of these materials. The Lehigh team presented this process recently to a national showcase of investors and industrial partners at the TechConnect 2015 World Innovation Conference and National Innovation Showcase in Washington, D.C. June 14-17. "Biosynthetic QDs will enable the development of an environmentally-friendly, bio-inspired process unlike current approaches that rely on high temperatures, pressures, toxic solvents and expensive precursors," Berger says. "We have developed a unique, 'green' approach that substantially reduces both cost and environmental impact." Quantum dots, which have use in diverse applications such as medical imaging, lighting, display technologies, solar cells, photocatalysts, renewable energy and optoelectronics, are typically expensive and complicated to manufacture. In particular, current chemical synthesis methods use high temperatures and toxic solvents, which make environmental remediation expensive and challenging. This newly described process allows for the manufacturing of quantum dots using an environmentally benign process and at a fraction of the cost. Whereas in conventional production techniques QDs currently cost $1,000-$10,000 per gram, the biomanufacturing technique cuts that cost to about $1-$10 per gram. The substantial reduction in cost potentially enables large-scale production of QDs viable for use in commercial applications. "We estimate yields on the order of grams per liter from batch cultures under optimized conditions, and are able to reproduce a wide size range of CdS QDs," said Steven McIntosh. The research is funded by the National Science Foundation's Division of Emerging Frontiers in Research and Innovation (EFRI Grant No. 1332349) and builds on the success of the initial funding, supplied by Lehigh's Faculty Innovation Grant (FIG) and Collaborative Research Opportunity Grant (CORE) programs. The Lehigh research group is also investigating, through the NSF's EFRI division, the expansion of this work to include a wide range of other functional materials. Functional materials are those with controlled composition, size, and structure to facilitate desired interactions with light, electrical or magnetic fields, or chemical environment to provide unique functionality in a wide range of applications from energy to medicine. McIntosh said, "While biosynthesis of structural materials is relatively well established, harnessing nature to create functional inorganic materials will provide a pathway to a future environmentally friendly biomanufacturing based economy. We believe that this work is the first step on this path."